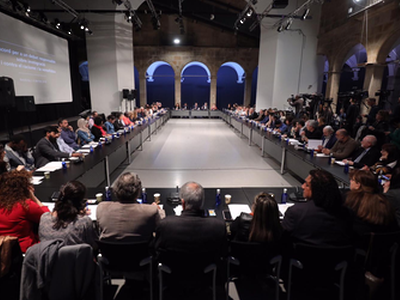 The president expressed these views at the closing of an anti-racism round table with representatives of political parties and entities, held this morning at the Centre d’Art Santa Mònica. The meeting, called by Torra and the Minister of Labour, Social Affairs and Families, Chakir el Homrani, led to a Catalan national agreement in support of social harmony. Participants included the Catalan ombudsman, Rafael Ribó; representatives of all parliamentary groups; local and county administrations; economic and social actors, and some fifty entities involved in the Citizenship and Immigration Council. The Minister of Labour, Social Affairs and Families also said: “This fight is a challenge for everyone. The Catalan model for welcoming newcomers is based on diversity and interculturality.” El Homrani stressed the importance of “balance in shared values, such as human rights, democratic freedoms and respect, and the value of differences”. “We’re committed to a broad social, political and institutional consensus that protects us from populist discourses and expressions of xenophobia that periodically resurface,” he concluded. In addition to President Torra and Minister El Homrani, the event was attended by the Secretary for Equality, Migration and Citizenship, Oriol Amorós; and the Secretary for Childhood, Adolescence and Youth, Georgina Oliva.